When the trees are sporting their new green leaves and the ground is warm and damp, it is spring in Minnesota and it is time to get into the woods and look for morel mushrooms. This has become one of my favorite springtime traditions. My husband, Adam, introduced me to morels several years ago. I still can’t believe something that delicious had gone under my radar for so many years. Once you get a taste of morels, there is no going back. They are delicious. I know many people don’t like mushrooms, but I am willing to bet that the vast majority of those people would love morels. They are nothing like the button mushrooms from the grocery store that you’ve likely based your mushroom disdain upon. In a way, I would prefer you to not try morels, because once you do, you will want more. That means less for me… so now that I think about it, maybe writing this article for Homestead.org wasn’t the best idea. If, to my dismay, you want to give morels a try, you simply have to get into the woods once the weather has been warm for a bit. Here in Minnesota, that is usually the end of April or beginning of May. Morels grow in woodlands throughout North America. They are very easy to identify. There are several poisonous look-alikes known as false morels, but it really is easy to distinguish the two. The true morel is hollow inside and the false morel is not. There is no separation between the stem and cap portions, and the inside of the whole fruiting body is hollow. They also are irregularly shaped compared to a true morel. Here is a great guide to help you identify morels. We always look for morels near dead or dying elm trees. They grow up from the forest floor. They can also be found growing near poplar, ash, and apple trees. When Adam and I, go we carry long sticks to move wood-nettle and other plants out of the way so that we can get a better view of the forest floor. Once you find one morel mushroom, be sure to look more around that spot because there are likely more to be found. Break the mushroom off at the base rather than pulling it so that you don’t collect dirty mushrooms. It is best to use a mesh bag to carry your morels so the spores can escape as you’re collecting. That way, your morel patch will reappear next season. Do not use a plastic bag or else your mushrooms will turn mushy and the spores will be trapped inside. We also usually collect ramps, aka wild leeks, if we see them. They have a great onion/garlic flavor to them. They go very well cooked up alongside the morels. I also like to bring my camera into the woods to take pictures of whatever catches my eye. There are many wildflowers in bloom at that time of year. Not to mention the wildlife that we encounter. Hawks, butterflies, deer, toads… if it moves, I will probably take its picture. Be sure to wear long thick pants. I learned this lesson the hard way. The first year that Adam and I went into the woods morel hunting, I wore leggings. Bad idea. We came into a thick patch of wood nettle. They are like stinging nettle on steroids. They were pricking/stinging me through my pants… ouch! Thankfully, Adam carried me through that patch. My hero! Morel mushroom hunting is not for the faint of heart. If the wood nettle doesn’t deter you, the hoards of mosquitoes and wood ticks might. Don’t skimp on the bug spray. Even though I usually leave the woods itchy and with a few wood ticks, the morels are worth it. They are so fun to find. I feel like I’ve won the lottery whenever I find a nice big morel or a large patch of them. 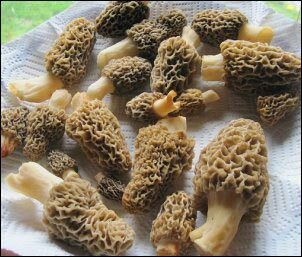 Once we get back home with our morels, it is time for a feast. Our daughters absolutely love morels as well. If we have had a good haul, we like to invite family over to share in our bounty. We give the morels a rinse, slice them up, and saute them in butter with a little salt and pepper, and sometimes throw in some wild leeks for another dimension of flavor. The morels have an amazing meaty texture and flavor. They are so savory. If we have a lot we dehydrate them and add them to various dishes throughout the year. This is enjoyable because not only am I able to enjoy that distinct morel flavor in soups and stews, but just seeing those dehydrated mushrooms enables me to relive the adventure in the woods again in my mind. Sometimes those memories are even sweeter than the experience itself. Morel mushrooms are as nutritious as they are delicious. According to Nutrition-and-You.com, morel mushrooms have the highest level of vitamin D out of all of the edible mushrooms. Vitamin D is a fat-soluble vitamin which is critical for bone growth and calcium metabolism. They also have a very rich mineral content, providing zinc, copper, manganese, and iron. These minerals play a role in blood cell production, immune system function, and neurotransmission. I don’t know about you, but I find the health benefits of morel mushrooms amazing. As if I needed even more reasons to eat them. Can I Grow My Own Morels? Someday, I may just try growing them myself. 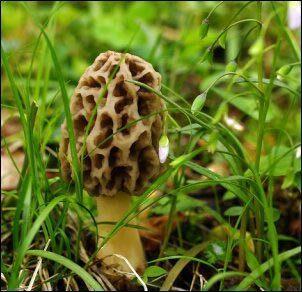 Even though growing your own mushrooms is possible, I have read in the past that growing morels was different However, a quick Google search about growing your own morel mushrooms will result in many articles and websites describing how to do it. There are also morel mushroom growing kits available to buy on Amazon. So if you would rather not go scouring the forests in search of morels, you can try planting them in your own backyard. How cool is that? 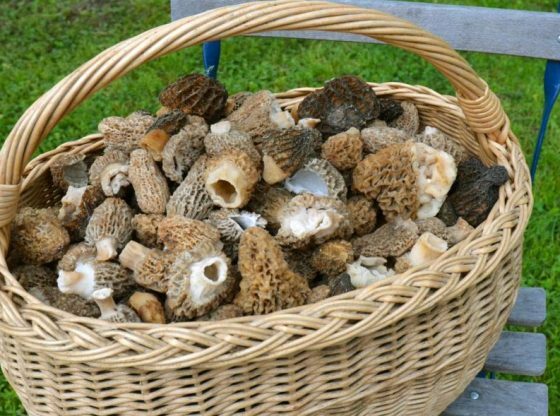 If you want to try morels, but you would rather not go into the woods or grow them yourself, you can check out your local farmer’s market in the spring. The farmer’s market in my town has “Matt the Mushroom Guy” who is there every week with his latest gatherings from the forest. In order to sell wild mushrooms at the farmer’s market, Matt had to take some classes to become certified. He is a wealth of knowledge when it comes to wild mushrooms and wild edibles in general. If you live in central Minnesota, and you want to meet Matt and purchase some mushrooms, come out to the Big Lake or Monticello farmer’s markets. You can follow him on Facebook as well to keep up with his latest mushroom finds. You can bet he will be out in the woods finding morels as soon as they begin popping up. If you’d like to start your own homesteading business, speaking to someone like Matt would make a good place to start. If you have never looked for morel mushrooms before, make this year your first. Start with morels, and then learn more about other wild edible mushrooms. There are many. Bring the kids along. My kids and I have found them at local parks just walking along a tarred path. Don’t let your fear of the unknown get in the way. If you have the desire to find them, do some research, join an online mushroom group, buy a mushroom identification book, but, most importantly, get into the woods and start looking. You don’t need to be a mushroom expert to identify morels. If I can do it, so can you.